Tim, from Charlotte NC, shares his Carrier Infinity Heat Pump price. We recently bought a home in Charlotte NC, and during the home inspection process, we found that we had to have the heat pump system replaced. Since we heard great things about Carrier equipment, we decided that a Carrier Infinity Heat Pump was the way we wanted to go and we set out to get heat pump prices from a few local contractors. We were prepared for the higher end cost of a Carrier Infinity Heat Pump… but we were surprised at the range from different contractors! One, a 25 year old company in town, was priced at almost HALF of what a much bigger and more widely known company was! We thought the larger company who is always on the TV would be better priced, we were surprised to say the least. Just goes to show – you REALLY need to get more than one estimate! The system below was almost 1/2 of all other estimates for almost identical parts. Took a crew of 2 guys roughly 12 hours, and on the second day, a third guy came and did all the start up. They never mentioned it in the quote, but during the installation I saw them make several sheet metal duct boxes (One of them was huge!) as well as using quite a bit of flexible ducting. Like I mentioned earlier, we live in Charlotte NC, and truthfully, I have no clue how old the existing system was, or how bad of condition it was in. We were told it needed to be replaced, and we bartered before closing to get it done! Infinity Estimates we declined: $18,230 & $19,500. The only real differences we saw from one to the next was in the contractors themselves. 2 of the three we spent the most time dealing with were the “big name” contractors you always see on TV and radio, we had never heard of the third, but they are in business +25 years. 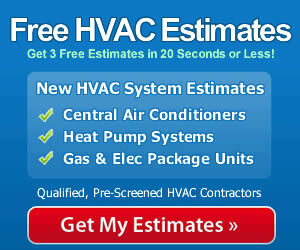 Like others, I just want to thank you for the great resource to get info and share prices of HVAC equipment. If I could instill one piece of advice to anyone, it’s get several quotes! If you would like to share information about your heat pump prices, please use the share-a-price page, and let us know. We try to publish one new estimate every day!